Burning Question: Is Seasonal Affective Disorder For Real? In seven seasons under head coach Jim Tressel, The Ohio State University football program has compiled an impressive 73-16 record, won four Big Ten conference titles, and appeared in three Bowl Championship Series, winning the national title in 2002. Yet, when seeking to avoid the complacency that may sometimes befall a program that reaches a sustained level of success, Tressel turned his attention from the gridiron in Columbus to the pool at Kenyon. In late August, the Buckeyes retreated to the College's McBride Field for an early morning practice and to draw inspiration from Jim Steen, Kenyon's longtime swim coach, who's directed the Lords and Ladies to an amazing total of fifty-one national titles. Steen's men's program has won an astounding twenty-nine consecutive national titles and his women's program has claimed twenty-two of the past twenty-five titles. The Ohio State players, coaches, and staff arrived shortly before eight in the morning and practiced for two hours, with Kenyon's football team and coaches observing from the sidelines. Following the workout, the Buckeyes took a brief walking tour of the Kenyon Athletic Center and paraded past all fifty-one of the Lords' and Ladies' national swimming championship trophies. They then made their way to the Toan Indoor Track, where Steen addressed the defending Big Ten champs. Steen, who just returned from the Olympic Games in Beijing, spoke to the Buckeyes about the accomplishments of eight-time gold-medal swimmer Michael Phelps. Steen explained that the hardest thing to do in any sport was to "win when you are expected to win." He also spoke of his obsession with being successful, the importance of overcoming complacency, and of avoiding expectations set by those outside of the program. Meanwhile, Tressel addressed the Lords football team and encouraged them to "take value out of the experience" of being a student-athlete. 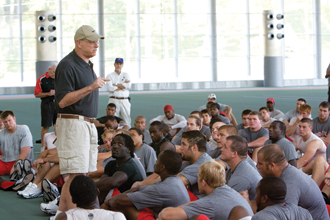 Tressel emphasized the life lessons learned on the field that will shape them into the people they are off the field. "Football's not a gentle game--it's a tough game," he said. "But that doesn't mean gentlemen can't play it."